Eggplant is one of the easiest vegetables to work with: You don't have to peel it, and it can be cooked in just about any method. My favourite way to eat and cook eggplant is grilled. When it's grilling season eggplants goes on the charcoal grill, and when it's not they go right on the grill pan. 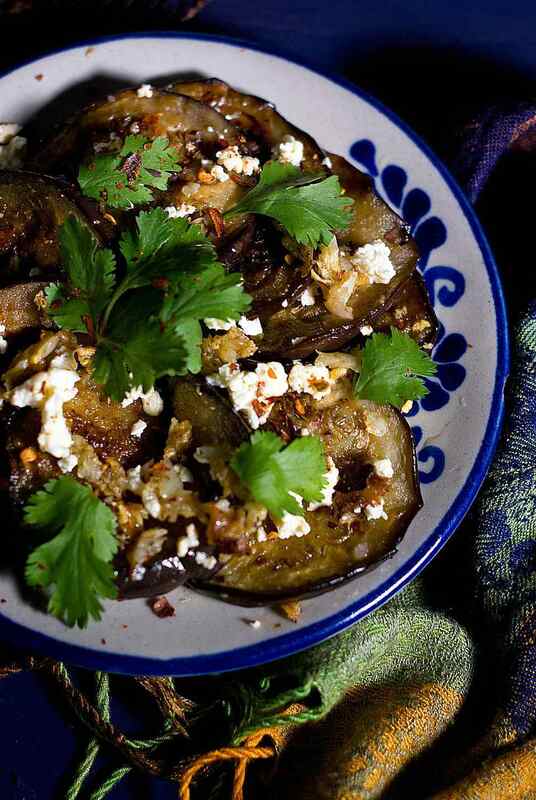 Eggplant packs so much flavour on their own that they don't really need much than a sprinkling of sea salt. But the great thing is that they also pair perfectly with many spices and flavours, like red pepper flakes. Endless possibilities. This grilled eggplant salad recipe doesn't require much effort and you probably already have everything needed in your refrigerator. You can serve the salad warm or make it ahead the next day. Pair it with a simple protein for a delicious complete meal. It is important to use a large non-stick pan for this recipe. Heat about one and a half tablespoons of olive oil in the pan. Once pan is hot, arrange the eggplant slices in one layer—do not overcrowd. You will most likely need to cook the eggplant in batches. Allow the eggplant to cook for about five minutes and then flip over and allow to cook until it is soft on both sides. Eggplant absorbs oil quickly so if you find that the eggplant is beginning to stick, add a little bit more oil or a couple of tablespoons of water to the pan. The water will help cook the eggplant without letting it turn too greasy. Once the slices are cooked through arrange on a large plate. Cook the next batch of eggplant slices and repeat until the whole eggplant has been cooked. In the same pan that you cooked the eggplant, heat a little bit of oil. Once pan is warm, add the minced garlic and sauté until it is soft and cooked through. Stir often to prevent the garlic from burning—avoid this; otherwise the garlic will be very bitter tasting. Distribute the cooked garlic (and the oil you cook it in) over the eggplant slices on the plate. Sprinkle the crumbled cheese over the cooked eggplant slices, then drizzle with the red pepper flakes, and lastly, add some cilantro leaves to the plate. Serve as is, warm, or keep in the refrigerator until ready to serve. You can also prepare this salad the day before, it tastes great too.